The slower time for the M5 is from a magazine test with a passenger. Stuck's time was also with a passenger but Stuck is obviously more comfortable pushing a car around the Nordschleife than HvS. I realy love BMW M5 E60 but I don't believe in 7;52 with Hans Joahim Stuck...Great driver, great car but i seems like mistake. 20 second less than is some mistake! Probably his drive G-Power Hurracan? Except there is no such car as a Shelby CV25. Also, If that 7:52 time is LEGIT, We should add it, I don't think it should matter if the speed limiter is removed, Its a handicap anyway. That 2007 M6 reaching 332Kph was also a Kelleners Racing M6 which did do a GPS Verified top speed of that, But that wasn't stock, No stock M5/M6 goes past 200Mph, The fastest TRUE GPS VERIFIED top speed of a M5/M6 is 194Mph, 315ph, Theres a SHITE LOAD of speedo videos, And everyone thinks there doing that, even some saying they did 211Mph and 215Mph lol Its true, Bmws are slippery. But not slippery enuff to do 330Kph plus, Not with 500Bhp. However though, as far as the 194Mph time is concerned, I do not know if its its FULL top speed, or if there was room for more. But a lot of this 200Mph+ stuff is only based on a speedo video on Youtube, And those can be anywhere between 15-30kph off. Like these videos...ALL speedos without a single spec of proof. As far as the CC V8S is concerned, 240Mph is only a "Claimed" top speed, No Koenigsegg has registered its claimed aerodynamic value tested, So I Highly doubt it would even go past 225Mph let alone 240Mph. Correct me if im wrong people. true, that was a speedo reading. There's a 2007 M6 video of 353kph speedo, 332 kph GPS verified. That had the same engine as the M5. 500HP. You don't need 600hp to get to 200mph. The Koenigsegg CC8S has only 655hp and can go 240mph (of course it was made to be slippery and no downforce unlike other sports cars). in theory, in the same car you'd only need 380hp to reach 200mph. No way a stock E90 can do 327! I am talking real 327 on GPS, not whatever is indicated on speedo. you will need around 600-620 metric horsepower in order to go over 325. 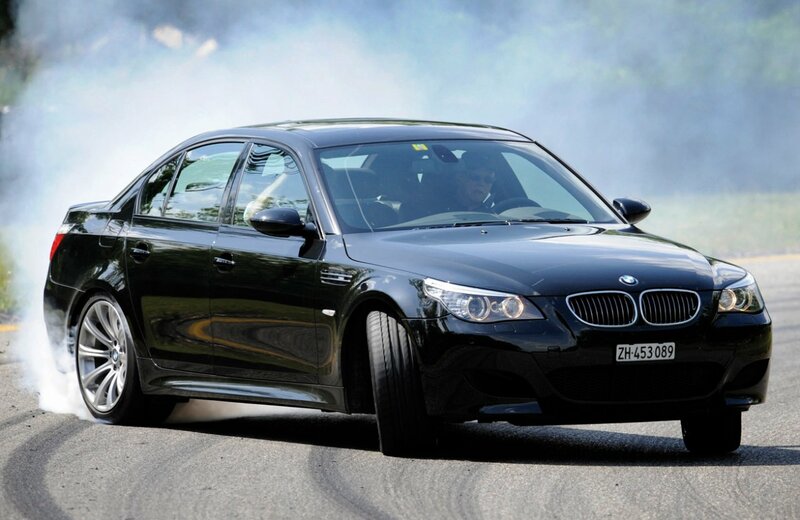 A stock M3 E90 with just 414 BHP can do 327 kph / 203 mph delimited. These cars are very slippery due to little aero body work. The 7:52 (driven by Hans Joachim Stuck) is believed to have been done with the speed governor removed. Since nobody is really sure, the time from SportAuto is still listed. 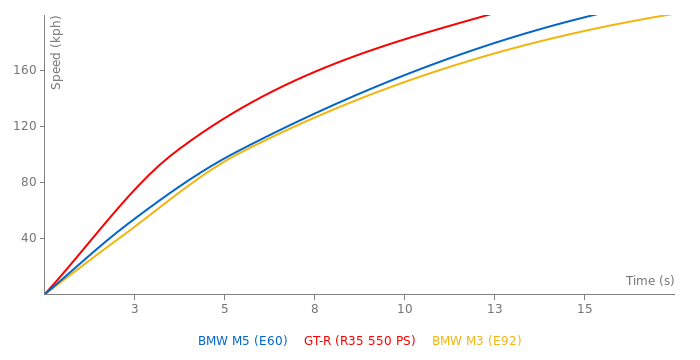 No, an M5 E60 would hit around 325 easily. 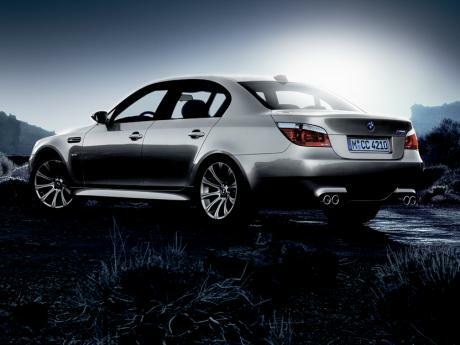 The E60 M5 does not hit 330 kph. Only 305 views - about the same as the new M5 F10 called. There was no more than 305 kilometers per hour in a stock M5, as you will need around 600-620 metric horsepower in order to go over 325. 330 if you have around 650. I understand, but ive seen lots of performance specs wich were even worse in comparing to the factory specs. So do they also change the specs if it is worse? Dude bmw has a launch control. So it depends on the driver how fast he accelerates. The launch control is something like a special boost or I call it sport modus. If a magazine or other publication records a faster time than the MFR, then the MFR time is replaced with the quicker time. incorrect compairing to the specs of the factory. Following my own exploration, billions of people in the world receive the personal loans at good creditors. Thence, there's great possibilities to get a short term loan in every country. This car IS 6 years old tho.